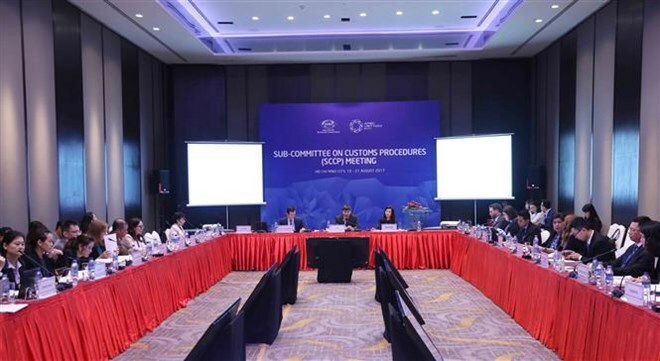 HCM City (VNA) – The second meeting of the Sub-Committee on Customs Procedures (SCCP) kicked off in Ho Chi Minh City on August 19 on the sidelines of the third APEC Officials Meeting (SOM 3). The SCCP set the 2017 target of facilitating trade and ensuring supply chain security as concretised in the SCCP Collective Action Plan and the sub-committee’s work programme 2017. Therefore, the three-day event will continue working on frameworks connecting supply chains, single-window mechanism, authorised economic operator (AEO), cross-border e-commerce, partnership between customs and businesses, and information technology and risk management. The first meeting of the sub-committee took place in Nha Trang city in Vietnam’s central coastal province of Khanh Hoa from February 21-23. Delegates looked into the priorities of the Asia-Pacific region such as promoting sustainable, creative and inclusive growth; enhancing regional economic connectivity; improving the competitiveness and creativity of micro-, small- and medium-sized enterprises (MSMEs); strengthening food security and sustainable agriculture to adapt to climate change. The meeting focused on implementing the WTO Trade Facilitation Agreement and the single-window mechanism, IT application and risk management in customs management, the management of cross-border implementation of intellectual property rights, and the enhancement of cross-border e-commerce. Vietnam suggested the APEC economies connect the single-window mechanism, increase sharing information about and experience in fighting smuggling and trade fraud, thereby helping customs agencies facilitate trade and ensure trade security in regional supply chains.